Mat Loz recently contacted me about his free puzzle app game Shuttle Shuffle. The objective is to slide the aliens to their ships. These puzzles are not too hard. However, solving them in the fewest # of moves is essential if you want to unlock the next level. 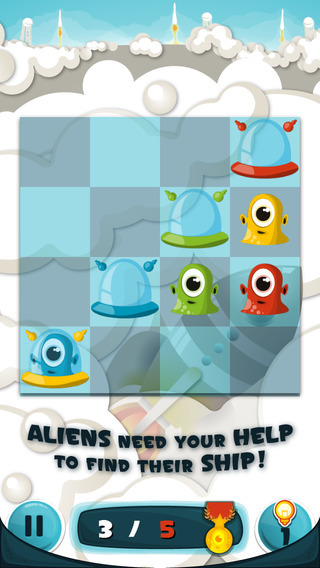 Sliding a row makes all the aliens travel together. That's really the key. While I was playing this game, I kept saying to myself: this reminds me of another game, but which?! The harder levels have death holes and wormholes. When I solved level 24, which is the last of the free levels, the board was completely filled, I realized which game this reminded me of. There are actually a lot of games which often bill themselves as 'the 2D version of Rubik's Cube'. If you get into Shuttle Shuffle, you can develop your own levels.